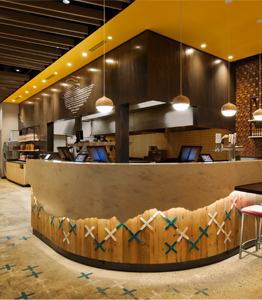 By contrasting elements and layering colour and texture, Nando’s in Kitchener embodies the welcoming atmosphere that Nando’s has become known for. Custom wood screens add drama and explore the verticality of space as they define the circulation zones. Repeated hand-crafted cross-stitch motifs and authentic African art pieces pick up the rich hues while adding artistic flare. Two of our condo projects have been nominated for several BILD Awards by a panel of industry judges. Aquabella, a collaboration with Tridel, has been shortlisted for Project of the Year – Mid/High-Rise. The Vanguard by Devron Dev. is a contender for Best Suite Design. 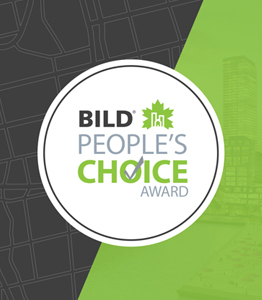 Both projects are in the running for the People’s Choice Award, which is awarded by public vote until March 31st. 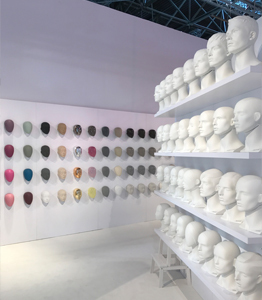 Earlier this month, Dan, Keith and members of the II BY IV DESIGN team attended EuroShop in Düsseldorf, Germany, the world’s largest retail trade show. Occurring only once every three years, the show attracts visitors from all over the world, and features thousands of exhibits within 18 huge exhibit halls to peruse. Dan, Keith and the team focused most of their attention at the Shop Fitting & Store Design exhibits, and also browsed through local stores and cultural venues. Here is a glimpse of some of the inspiration gleaned from this impressive trip.